Summer generally brings warm to hot temperatures and less frequent rainfall. Rory Lewandowski, extension educator in Wayne County, Ohio, notes that cool-season grass pastures grow best when temperatures are cool to warm and moisture is plentiful. Thus, seemingly every summer, there is a slump in pasture productivity. The first “R” is remove seed heads. Clipping off seed heads in late June will return grass plants to vegetative growth and improve the quality of the forage that is grazed. The second “R” is right starting height. Do not let livestock into a pasture paddock where grass height is too short because this is almost certain to lead to overgrazing. What is the right height? It depends upon the predominant grass in the pasture mix. Graze perennial ryegrass when it reaches a 6 to 8 inch height. Orchardgrass and endophyte free or novel endophyte tall fescue grass should be grazed starting at an 8 to 10 inch height. Graze endophyte-infected tall fescue and Kentucky bluegrass at a height of 5 to 6 inches. The third “R” is residual leaf area. Do not overgraze pasture paddocks. Pull livestock out of pasture paddocks while there is still sufficient leaf area for the plant to continue to photosynthesize. The general principle that is taught in grazing schools is to take half the plant and leave half the plant. Leaving sufficient leaf residual has several benefits. When more than half the plant is grazed or clipped off, root growth is drastically affected and the plant takes longer to recover from defoliation. Leaving half the plant allows root growth and function to continue with very minimal reduction and the plant recovers rapidly from the grazing defoliation. Leaving more residual leaf area helps to shade the soil. In the summer heat, this can mean cooler soil temperatures and less moisture loss from the soil, important considerations to keep grass growing. In general, do not graze below 3 inches in height for perennial ryegrass; below 4 inches in height for orchardgrass, endophyte free or novel endophyte tall fescue; and do not graze below 2 inches in height for Kentucky bluegrass and endophyte-infected tall fescue. The fourth “R” is rest period. After a grazing pass, allow enough time for that plant to regrow back to the right grazing height. The length of this rest period is affected by how much leaf residual has been left, the air and soil temperature, and soil moisture. Summer pasture rotations need to slow down because the grass is growing slower. For example, during the favorable temperatures and moisture conditions of spring and early summer, grass is growing fast and it may have been possible to get back to a pasture paddock within an 18- to 25-day period for another grazing pass. In the summer the rest period required for that same plant to regrow to the right grazing height may be anywhere from 30 to 50 or more days. During drought conditions, plants may stop growing. In this case, avoid overgrazing by stopping rotation between paddocks and keep livestock in a sacrifice area. The only way to maintain the longer rest periods needed during summer weather is to have enough pasture paddocks or divisions. Most experienced graziers have at least 10 pasture paddocks or run multiple pasture divisions as they strip graze across a pasture. 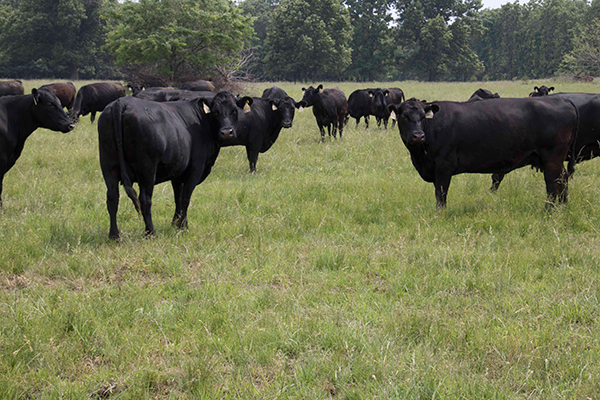 Summer weather can negatively affect cool-season pastures, but following good grazing management practices can minimize those negative effects.